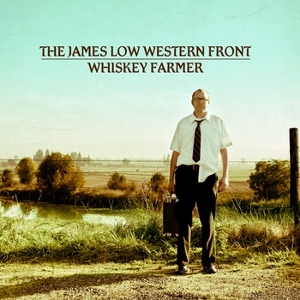 The James Low Western Front shortens the distance from Portland to Nashville and their new album Whiskey Farmer urges you to pour yourself a stiff one while going through a series of stories about its lead character. In the title track Low softly sings, “Now the sun won’t shine, the rain won’t fall. Horse won’t pull my plow. I’m a whiskey farmer trying to grow champagne.” You’ll instantly see yourself at a rural bus stop with nothing but pockets full of shattered hopes, and a sack of good intentions. Often compared to Gram Parsons, there are also moments on the album that are reminiscent of early Wilco and Lucinda Williams. Low, who wrote the wistful tunes, is accompanied by Tim Huggins on bass/vocals, Dave Camp on guitar/vocals, and Joe Mengis on drums. Together they paint a bittersweet landscape of dirt roads and disappointments. Meanwhile, hopeful twangs of pedal steel, played by Paul Brainard, tug at the heartstrings. There is a glimmer of promise in “Thinking California,” which is also the first video from the album. Low plans to make one for each of the eight tracks. This is the perfect record for a proper brooding session. The music is lovely and the comfort is good, but don’t expect too much sympathy from the whiskey farmer. He’s got loads of troubles of his own.